University of Maine student Eric Wiater operates one of the Athletics department’s HITACHI Z-HD5000 cameras. The Athletics department at the University of Maine (UMaine) selected Z-HD5000 cameras from Hitachi Kokusai to provide the pristine picture quality and outstanding ease of use they needed. Building on the benefits the cameras bring to their live sports productions, the university also plans to extend its use of Z‑HD5000s to the educational curriculum with new video production courses next year. The University of Maine advances learning and discovery through excellence and innovation in undergraduate and graduate academic programs,while addressing the complex challenges and opportunities of the 21st century through research-based knowledge.The university’s Black Bears compete in the America EastConference of NCAA DivisionI for all sports except hockey and football, which compete in the Hockey East conference and Colonial Athletic Association, respectively. While the university had previously performed some live video production using entry-level equipment, the conference’s agreement to bring UMaine Black Bears basketball games to multi-screen sports network ESPN3 required the school to deploy higher-caliber workflows and solutions. For sports that are not shown on ESPN3, the school also wanted to deliver similarly high production values when streaming matches to social media platforms including YouTube. Familiar with Hitachi Kokusai cameras from his Communication Studies courses at Canisius College in Buffalo, NY, University of Maine Athletics director of digital content Sam Hallett knew they would be an ideal fit for the project.”I had worked with Z-HD5000s in my own educational studies, so I knew I wanted to go that direction and that they would be easy for the students to learn and operate,” he explained. The university currently uses two Z-HD5000s on tripods to provide main game and close-up shots, with a goal of adding two more as handheld cameras on the sidelines in the future. Video, audio and intercom signals are transported over a single SMPTE fiber cable per camera to half-rack width CU-HD1000 camera control units (CCUs) in custom flypacks, minimizing cable runs and speeding setup times as the equipment moves between venues. 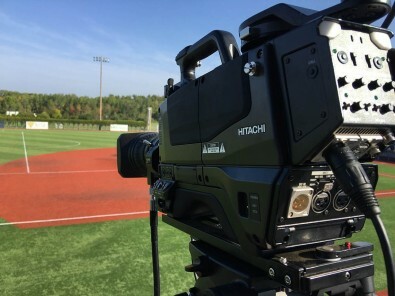 UMaine use the Hitachi Z-HD5000 for ESPN3 feed and streaming to social media platforms. Initially used for basketball, baseball and softball, the cameras will shoot an expanded array of sports in upcoming semesters, including soccer and field hockey. Hallett also plans to bring the cameras’ benefits to a classroom setting, with a goal of teaching video production through new course offerings in 2018. “We rely on student operators for our productions, so in addition to giving students valuable hands-on experience they can use in the workforce, educating them will help provide an ongoing supply of crew members for our broadcasts,” Hallett explained. While that future looks bright, the cameras have already delivered the tangible benefits that the university had sought to achieve. “The Z-HD5000s have simplified the whole production process for us, takinga lot of the technical burden off the student operators so they can focus on the actual task at hand: great game coverage,” Hallett concluded.